Four claw or prong setting: With a four claw setting there will be less metal holding the centre stone, making the diamond the main attraction of the ring. Six claw or prong setting: The six claw setting is known for holding a diamond more securely in place. It also offers more protection to the girdle than the four claw setting. Double claw or prong setting: A double claw setting is a four claw setting that is divided into smaller pieces; by doing this the four claws are transformed into eight claws. It securely holds the diamond in place, while giving the ring an elegant look and feel. The double claws are set closely together and add to the overall design and look of the diamond engagement ring. V-claw or prong setting: In most cases, diamond cuts such as the princess, marquise and heart-shaped diamonds need a little more protection when it comes the delegate edges of the corners. The V-claw will assist in covering those edges and preventing them in everyday wear. Tube or bezel setting: A tube setting is a rim of metal, which perfectly surrounds the entire centre diamond while holding it securely in place. Semi-tube or semi-bezel setting: The semi-tube setting holds the centre stone in place by hugging the opposite sides of the diamond with metal. Bar set: The bar set features small metal bars on the side of the diamond, which holds the centre stone in place; only a half of the diamond is covered with the metal leaving enough space for the diamond to sparkle. Straight shank: If you have a glance at an engagement ring with a straight shank the entire band around the ring will have the same width from the base of the setting to the back of the shank. Tapered shank: Unlike the straight shank, the width of the tapered shank will become narrower the closer it gets to the setting. This type of shank is particularly popular in classic solitaire engagement ring styles where the emphasis is on the centre diamond. Reverse tapered shank: The band on the side of the centre stone becomes wider toward the bottom of the ring. Knife-edge shank: The knife-edge shank is known as the sharp rectangular edge that meets at the top point of the ring. Split shank: The sides opposite the centre diamond are open giving the ring an elegant look. Traditional: A traditional shank is a classic circular profile most commonly found in diamond engagement ring designs. D-shank: The D-shank is formally known as the European setting. The inclusion of the D-shank setting gives the impression that the bottom part of the ring is square rather than round. Raised shank: The cathedral shank uses arches of metal to hold and raise the height of the diamond setting. Overlap or bypass shank: The overlap shank is where the band on each side of the centre stone bypass one another to give it the appearance of an overlap. The hallmark of the ring is engraved in the metal on the inside of the shank. The hallmark is the brand, i.e. : Shimansky. Every ring will contain the stamp of the metal used, i.e. : 750 in the case of 18K gold and 950 in the case of platinum. Other details such as centre diamond used may also be engraved on the inside of the shank. Did you know Shimansky offers a complimentary engraving service with every engagement ring purchase? The service allows you to add a personalised touch to the ring by giving you an opportunity to engrave a special message to your loved one on the inside of the band. The anatomy of a diamond ring is truly fascinating. Make sure to review the infographic before purchasing a designer diamond engagement ring for your soulmate. 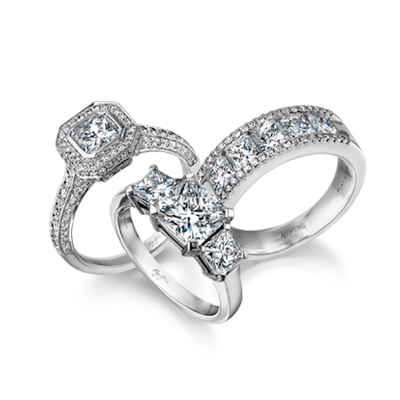 If you need any assistance on what engagement ring to buy the love of your life, visit your nearest Shimansky store. A diamond expert will be more than willing to assist.